This short-cut recipe will give the impression you've made your own raspberry ripple from scratch, but is in fact much simpler. You can save even more time by using ready-made raspberry coulis instead of making the sauce. First, make the sauce. Place the raspberries and sugar and the lemon juice and zest in a small pan. Bring to the boil then reduce the heat and simmer for 10 minutes or until the mixture thickens. Take off the heat and pass through a plastic sieve to remove the pips. Cool completely, then add the Supercassis. Drizzle the cold sauce into the softened ice cream and quickly marble it through, using a folding motion with a metal spoon. Scrape into a freezerproof container and refreeze immediately until solid (2-4 hours). You can freeze the ice cream in a plastic box, so you can scoop it out in balls, in a terrine so you can slice it, or in mini pudding moulds to make individual ice cream puddings. To turn these out, dip the moulds briefly in hot water, then invert. 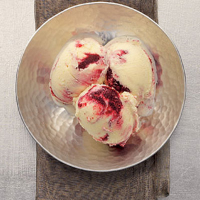 Serve the ice cream plain, or garnish with crystallised rose petals or fresh raspberries. This recipe was first published in Thu Dec 01 00:00:00 GMT 2005.